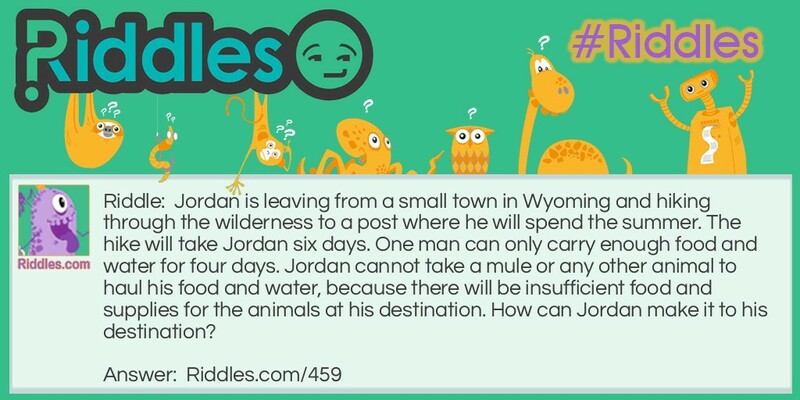 Jordan is leaving from a small town in Wyoming and hiking through the wilderness to a post where he will spend the summer. The hike will take Jordan six days. One man can only carry enough food and water for four days. Jordan cannot take a mule or any other animal to haul his food and water, because there will be insufficient food and supplies for the animals at his destination. How can Jordan make it to his destination? Jordan takes two other hikers with him. Each hiker starts out with a four day supply of food and water. After the first day, the first hiker gives a one day supply to each Jordan and the second hiker. This leaves the first hiker with a one day supply to go home and Jordan and the second hiker now each have a four day supply again. After the second day, the second hiker gives Jordan a one day supply and keep a two day supply for himself so that he can get home. This gives Jordan a four day supply of food and water, and now he has enough to reach his destination. The Hiker Riddle Meme with riddle and answer page link.